It’s a question we are asked repeatedly and there is no simple answer. The visual difference between double and triple glazed units is barely noticeable when they are installed. But there are cases where double glazing outweighs the benefits of triple glazing and vice versa. It depends on your needs and priorities. Triple glazing is not always more thermally efficient. If your main priority is retaining heat and saving energy, you need to consider the glazed unit composition. 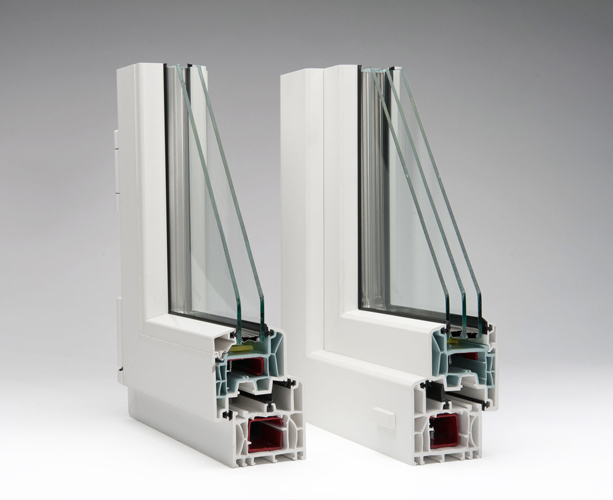 To achieve the best level of thermal efficiency in a triple-glazed unit, the overall thickness should be 38mm, with a minimum cavity of 16mm between each pane. Compromising here could mean there is no advantage in choosing triple glazing over double. For example, triple glazing in a 28mm unit will reduce your cavity space to just 8mm. The overall U-Value of this unit would be 1.3, compared to the 1.2 you could achieve with a lower cost double-glazed unit. Triple glazing provides better sound insulation. Regardless of its overall thickness, triple glazing is better at insulating against outside noise — so if you live in a noisy area, this might be the better option. You don’t have to install triple glazing throughout your home, you can just use it in the rooms that are most affected. Triple glazing weighs significantly more. Triple glazing weighs around 35% more than double glazing. This is something you need to consider if you’re thinking of using triple glazing in a movable unit — such as a bi-fold, sliding patio door or opening window. The extra weight can make the mechanism harder to operate and will limit the size options available to you. We would generally recommend triple glazing for larger expanses of glass that remain static. For example, for some roof lanterns and for any glass curtain walling. These are the products where you will notice the benefits of triple glazing most. Take a look at the comparisons below. They will help you decide if the benefits of triple glazing will outweigh the extra costs. If you have any further questions, please contact our team. Triple glazing is a better insulator against outside noise and is recommended if you live near a busy road or industrial area. Triple glazing is more effective at reducing the amount of condensation that builds up on the inside of the glass. If your home is susceptible to condensation there may be other problems to address, but triple glazing is a step in the right direction. If you don’t have either of these issues, the small amount of extra thermal insulation you will get from triple glazing is not worth the extra cost. The cost of double glazing is much lower than triple glazing and offers similar energy efficiency. Double glazing is lighter and makes movable units — such as bi-folds, sliding doors and opening windows — easier to open and close.